Note: This documentation page assumes that you have already set up an account for your site with Google Analytics. If you have not, please visit Google's designated page to do so, or their help page for more instructions. 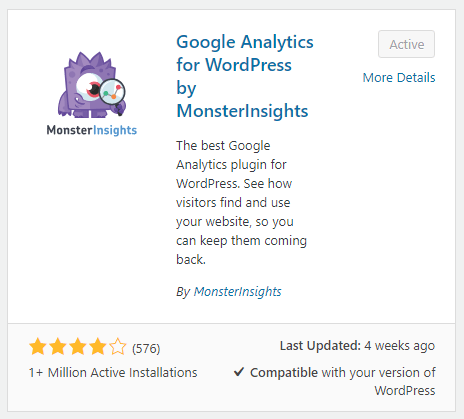 You can do this by going to your WordPress > Plugins > Add New page and searching for "Google Analytics for WordPress by MonsterInsights", and following the standard procedure to install and activate the plugin. It should be the first one from the left to appear, but also be sure that MonsterInsights is listed as its developer. Or, you can also manually download it here and then install it to your WordPress site. To do this, go to your WordPress Dashboard > Pretty Links > Options > Links > and enter in your slug without slashes into the "Base Slug Prefix" option > then click the "Update" button at the bottom of the page. You can learn more about this option here as needed. We recommend using "out" or "go" to keep the base-slug short and easy to remember. This is done by going to your WordPress Dashboard > MonsterInsights plugin > Settings > Tracking tab in top menu > Engagement tab in left menu (should have defaulted to this) > and click the radio button for the "Yes" option under "Enable MonsterInsights events tracking" > then click the "Save Changes" button. 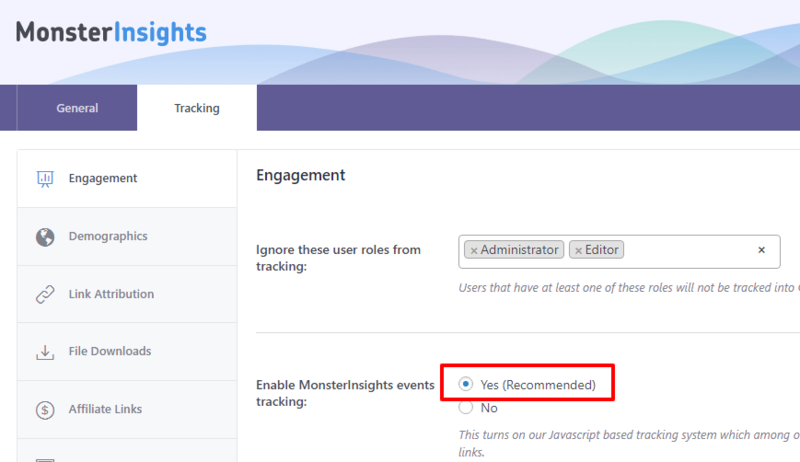 While still in the Tracking tab of the MonsterInsights plugin go to the Affiliate Links tab in the side menu. Here, you will be able to enter the slug you created in Step 2 so that MonsterInsights knows what to be looking for. If you entered out for example as your Base Slug, then here, you will want to enter it as /out/. For your label, please use a label that has no spaces or upper or lower case letters. So for example, if you want to use Pretty Links as your label, please enter it as pretty-links. Entering it like this will help keep reports looking uniform as this is the way Google likes to report. With the previous steps completed, MonsterInsights will send tracking data to Google Analytics where you can see clicks in real time. This can be seen in your Google Analytics account page at https://analytics.google.com > Reports > Real-Time > Events tab. Testing this out will be as simple as clicking on any Pretty links on your site that have the Base Slug you created while in an incognito window. Here is an example of what this may look like from Google Analytics in real time. MonsterInsights event tracking will only track events that happen within your own website's content. Meaning, if you share your pretty links on Facebook, or other social media or 3rd party sites, email campaigns etc. Clicks on your pretty links from those off-site locations will not be tracked inside Google Analytics. Off-site clicks will still be tracked within the Pretty Links -> Clicks reporting page though.